The excitement of the holiday season is not quite upon us. Yet here at Santa Parade HQ we are already seeking community members to work on new and creative ways to entertain the thousands of spectators at the 2018 Guelph Community Santa Parade. Taking place on Sunday November 18th, this much-loved civic celebration needs your help to make sure that Santa Claus feels as welcome as possible in our city. There are a number of ways to get involved. Don a Santa suit and run in aid of Big Brothers Big Sisters of Guelph. This 3km festive fun run takes place on the parade route in the minutes before the parade starts. Register early here and qualify for the early bird fee of just $30 before October 31st. With spectator numbers now close to 20,000, your business can partner with us to gain recognition and kudos at Guelph’s largest attended single day event. See the 2018 Sponsorship Packages here. The parade is a great way to engage with the community so gather your people, create costumes and take part in the event itself! Take a look at the 2018 Application Package here. Santa needs you! Join the parade day team and volunteer as a banner holder, a parade marshal or crowd control. We always need lots of help and you can take a look at the details here. 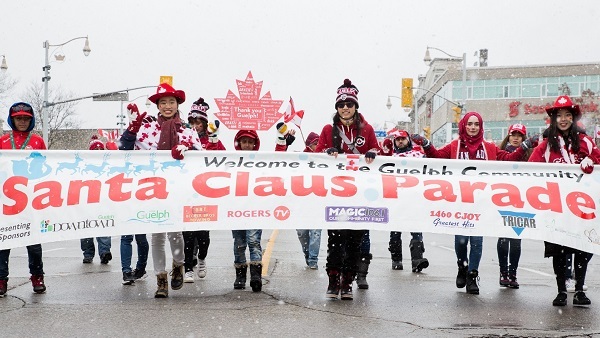 Organized by event professionals at the Downtown Guelph Business Association, the parade continues to be a much-loved civic celebration. Thousands of spectators enjoy the marching bands, colourful floats, dancers and elves go by. With your help we can make bring even more entertainment to the streets of Downtown Guelph!